Platypus Game Review - Download and Play Free Version! Incredibly fun Claymation shooter that is incredibly hard to stop playing! Claymation style graphics are a unique twist. Upgradable gun and random bonuses increase your firepower. Multiplayer lets you and a friend cooperate to complete levels. Adjustable difficulty so players can tune to their level of play. Without upgrades it can be nearly impossible to kill enemies. Relatively simple game could become boring after a while. Blast Away in a World of Clay! 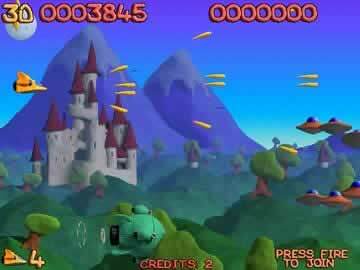 Platypus is a new arcade style shooter adapted for download. The graphics are superb and the gameplay is really, really fun. 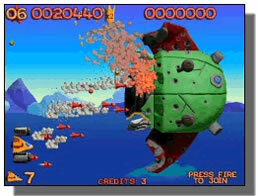 Like most side-scrolling shooters, you man a little space craft that blasts alien ships. Along the way, you can shoot formations of ships that will yield 20 seconds worth of new weaponry. These powerup weapons are essential to your success and will help you blow those clay aliens to kingdom come. I am not sure what it is exactly about Platypus that makes it so fun, but this game is hard to put down! The game is challenging, even on easy mode. Enemy bosses are well done and add to the classic feel of arcade shooter nostalgia. Just a well done game all around that is very fun to play. In Platypus, a side scrolling arcade style shooter, your goal is to eliminate the waves of enemy ships on your way to the area bosses. The great claymation style graphics combined with the arcade style soundtrack ight make you try to put quarters into your computer. This game is a great way to experience the lighter side of arcade style shooters. 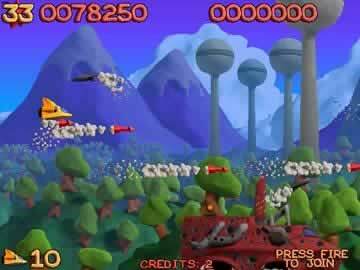 You must defend your home world from invasion in the platypus fighter. The ship is shaped in a way that reminds you of a platypus with the front end resembling a beak. You will face a variety of ships in many shapes and sizes. Special formation ships must be eliminated to obtain the crucial gun upgrades. Gun upgrades only last for 20 seconds so you have to keep getting them. There are five areas, four of which have five levels including a boss on the fifth level. The fifth area is just a boss you must defeat. The controls for Platypus are very easy. You can use the mouse, keyboard or a joystick. Your ship can move up, down, left and right. You will also need to fire your weapon using the appropriate button. The levels can be completed alone or with a friend (one of you will use the mouse and the other will use the keyboard). There are in game pick ups that will give you a 20 second powerup for your weapon. These powerups include rockets, spread shot and rapid fire. On top of these pickups there are random crates that can offer items such as point multipliers or rotating guns on your ship. High scores are tracked so you can compete for the high score if you have mastered the game. There are also hidden bonuses such as the passive resistance bonus in the first level. Platypus uses claymation style graphics which is unique to this particular genre. Every detail from the background to the bullets you shoot were crafted using plasticine. A picture was taken of each and imputed into the computer for use in the game. The sound also really adds to the game. It is reminiscent of classic arcade games and will make you feel like you are in an arcade yourself. While this is a great game, Platypus still has a few faults. In the later levels it can be nearly impossible to kill enemies with the standard gun. If you happen to run out of time on your upgrade you will simply have to dodge the ships until you can get one. This can be frustrating when what you want to do is destroy ships. Also there is not a lot of variety in the levels, most are similar or even the same. The background may change but the waves stay relatively the same. This could be boring if you want to play the game repeatedly. This is a great arcade style shooter. With the fun graphics and engaging music this is a game that will be fun for the whole family. The controls are simple to use for everyone. Platypus, while having almost nothing to do with the animal, will entertain you for hours as you shoot for the high score or getting all the bonuses.